Auburn Correctional Facility is located in Cayuga County New York. 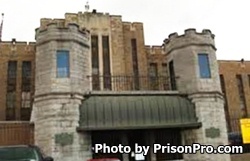 It is a maximum security prison that houses adult males. The current capacity of this facility is 1,821 offenders. Inmates are housed in five blocks A, B, C, D, and E. Recent reports have shown D block to have less then adequate conditions to house inmates. This is the facility where the "Auburn System" was first instituted, which was a correctional strategy that used contemplation, humane treatment, and hard labor to rehabilitate inmates. Today this prison has three correctional industries, license plate manufacturing, furniture manufacturing, and upholstery. Vocational programs offered at Auburn Correctional Facility include building and custodial maintenance, flooring installation, drafting, electrical, masonry, general business, painting, and welding. Offenders can also receive adult basic education and GED courses, additionally inmates can take college classes offered by the College Prison Education Program at Cornell University and an associates degree program offered through Cayuga Community College. Visiting occurs on weekdays from 9am-3pm (you must arrive by 2pm when processing closes). Their is visiting on weekends from 9am-3pm but the schedule alternates days by the first letter of the inmates last name, contact the facility for the current weekend rotation. No limit exists for the number of visits an inmate can have, however they are limited to six visitors at a time during weekends and weekdays, and four visitors at a time on Holidays (children under 1 year old are not counted).